April and the Extraordinary World offers a unique alternate timeline in which humanity’s greatest scientists and inventors have all gone missing. In their absence the world has been stuck in a state of arrested development, unable to progress beyond the steam age. As such, the artistry here involves a fair amount of steampunk style machines and pieces of technology. It’s near post apocalypse, considering mankind has nearly exhausted the planet’s forests and coal reserves. It’s led to war between Europe and North America over what remains. But in the meantime, all remaining scientists are locked away by the government to do their bidding. April (Angela Galuppo) is the daughter of two scientists, Paul (Mark Camacho) and Annette Franklin (Macha Grenon) . They’ve worked for years on a serum to end sickness, disease, and death from old age. The government wanted a super soldier serum, but April’s family of scientists, including her grandpa “Pops” (Tony Robinow), have been trying to cure disease instead. That is until the police are forced to round up all scientists and all scientific practice becomes illegal when not done explicitly for the government. Of course the serums are tested on animals, and the failed serums have interesting consequences. Usually it just grants them the gift of speech, as it does for April’s cat Darwin (Tony Hale), but soon enough talking lizards employed by the government turn up as well. These talking lizards are the film’s villains. They’re the product of one of April’s ancestor’s experiments. Now they lead the government project to capture scientists and put them to work creating super soldier serums. The serum April ends up discovering isn’t exactly the super soldier serum they want, but it ends up being much better. In addition to curing sickness and disease, it allows speedy recovery from any and all injuries. The obvious practical application here involves healing the world by promoting regrowth of the earth’s plants and resources. However, the villains want it for their own nefarious deeds. April and her talking cat Darwin end up separated from her parents, who get captured by the government fairly early on. In order to get them back April gets help from her grandfather and a pickpocket named Julius (Tod Fennell) - whose loyalty is called into question numerous times throughout the film. Nevertheless a growing attraction between April and Julius sparks some romantic drama as well. It’s an imaginative world, an intriguing alternate universe, and a compelling story of family, science, and budding romance. And it’s all set in a handful of pretty spectacular set pieces. Perhaps my favorite features twin Eiffel towers standing close enough together to serve as a giant cable car station. The film and the animation style is based on the graphic novel of the same name by French comic artist Jacques Tardi. It features a mix of imaginative steampunk machinery and near grayscale backgrounds, until the story takes some twists and turns allowing bright colors to wash over the previously dour scenery. The film juggles a lot of characters, but always does a good job making their motivations explicitly clear. From April and her circle of friends and family to the disgraced cop who goes from hunting them to helping them, there is remarkable depth to the characters. No one feels left out, or out of place. And the English dub (which is the version I watched) includes the strong, recognizable voice talents of Tony Hale, Paul Giamatti, Susan Sarandon, and J.K. Simmons. It all comes together in what is one of the strongest animated films released in the last few years. In fact it’s so good, it often recalls the work of Hayao Miyazaki both in quality of animation and storytelling. I can think of no greater praise to give an animated film. Rare is the film that goes back to a time when mankind was fascinated by science, invention, and the places our minds could take us. Too many films involve robots or super heroes punching each other. Don't get me wrong, there's enough action to appease the fidgety children as well. Suffice it to say, this film will undoubtedly keep the adults just as entertained as the kids. I’m sure parents cling to that hope for every animated film that gets released. 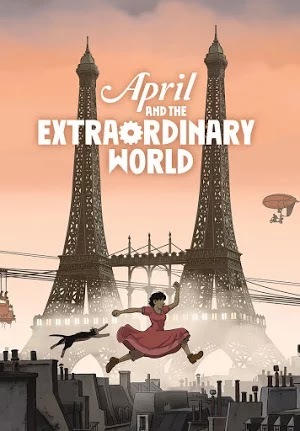 Have no fear, April and the Extraordinary World delivers.